It took me a week to find Internet access that I could use with my computer. Now that I’ve found it in a community center not far from where I live, I’ve once again discovered the motivation to start making this blaug, too. It’s a slow start, as is always the case with me: Setting up the site has taken me near closing time for this place, and I must end soon. But my motto has changed from “All or nothing” to “A little is better than none,” so I’ll share what with you now that I can. 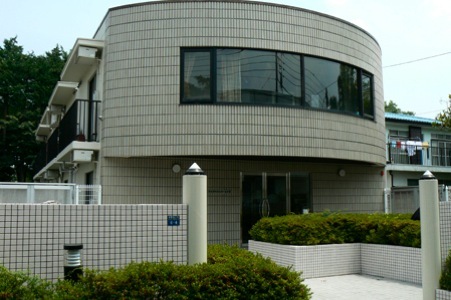 Pictured above is the dormitory for Sato Photo Co., Ltd. employees in Koganei, Tokyo, which is where I live. Yesterday I created a tour of my room (.mp4, 219 MB) for you to watch. [iWeb is messing this link up somehow. Right-click to download it, make sure that the file extension is .mp4, and then try to watch it.] As you can see in it, my room is actually quite spacious for Japan, and it came with many more luxuries than I was expecting. And it’s even a lot brighter and happier in real life than in the video—I think my camera’s aperture didn’t readjust after being outside. The best stories of my time in Tokyo so far surround my experiences at work and the commute between there and home. Now that this site is in place, I’ll be able to upload more of my experiences as I have time to write and photograph them. Thank you for using your time to join me!